This is another installment of the series “Grow It Strong: Business Ideas For A Dream Company. Our road to the exceptional team, winning culture and Fortune 500 clients”. In case you’ve missed the previous posts, feel free to explore them here. If you have decided to join the up-and-coming startup and business founding trend or are already in, then you probably understand that a huge part of your success depends on the right people to work with. A perfect team is like a perfect pair of shoes – it’s comfy and becomes you and you know you can walk longest distances without getting tired. And it’s sometimes hard to find. you don’t want to miss one nitty-gritty point. How your employees are doing now is important, but equally if not MORE important is what destination they will reach on their job path later. Each member of your team should evolve: start from accomplishing things they are told to and even in a way they told to and end up with self-developing and tuning their skills, extending the area of expertise and becoming a pro able to teach vs. just learn. Imagine that employees are wheels of the vehicle that is your company: if the wheels ain’t moving, you’re stuck. To move forward, employees need to keep in mind some sort of job goals, both short-term and long-term, to know the direction to go. Though a team member might be totally capable of setting proper aims, you as a business owner/founder with a broader vision of the company can articulate or visualize these expectations better. By doing this, you let the people have a reminder, a mental sticker to always remember what to focus on. they should go in line with the company objectives and mission. And you need to make sure that your team fully understands, accepts and truly commits to these goals. The best way to do it is to have a casual, relaxed discussion outside the office. We personally booked a lounge room at a nice restaurant and after having a delicious dinner, proceeded with presenting requirements for each position and getting feedback from the guys. We never meant to force the goals, everyone was welcomed to give their honest opinion and agree/disagree. The more your employees are involved in goal setting for themselves and the team, the more committed to the goals they will be. 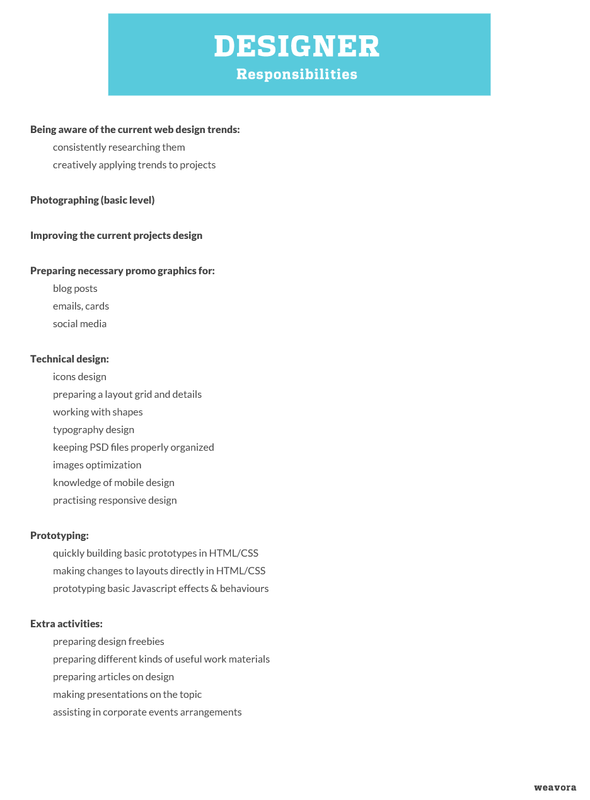 For you to have a better idea of how these goals can look like, I’ve provided the senior developer’s and designer’s requirements below as an example, just the way they have been presented to the team. 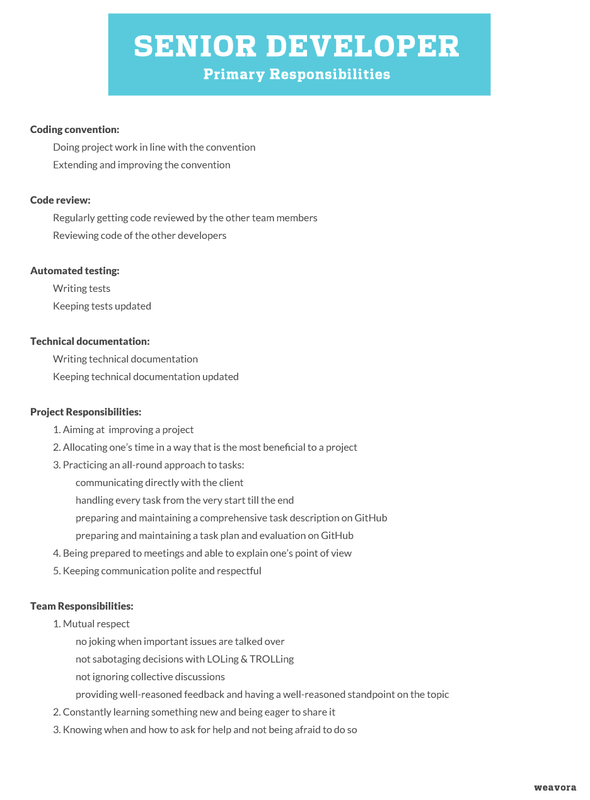 Note: the following requirements are just the most wanted skills or qualities and we by no means constrain the team’s professional development with them. Only sky is the limit to what the guys could become! One more thing I’d like to stress is that you need to get back to the goals at least twice a year to see where your team is, to review, reevaluate and perhaps adjust the requirements to the current work context. It’s natural that your company priorities may shift a bit over time so make sure your employees’ goals adapt accordingly. Stay tuned for the next part of the series where I’m going to share thoughts on some hot trending self-development & business books we’ve read recently seeking for ideas on improving the working environment. What’s your experience with setting performance goals for employees? Do you think team members need to figure out those themselves or is it a manager’s call? Awesome This is Great useful information.